​*​Go beyond the basic right movements, spice up your dance and challenge your style !! Dancing is one of the best ways to relieve stress and bring happiness to your life. We offer styling classes that are full of fun along with great technique and tips. GO BEYOND THE BASICS, SPICE UP YOUR DANCE AND CHALLENGE YOUR STYLE !! 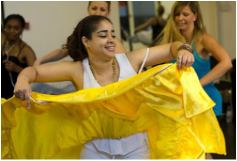 Focus is placed on the fine details, tips and teaching the authentic dance style. In these classes we will concentrate on the arms, footwork, styling and dancing freestyle so it is important that you know the correct basic steps before joining us for this class. ​Now... lets dance and find yourself through Dance. Why dance styling with us? *connection with the movements...and more..
You will see an improvement in your dancing which will become more fluid, versatile, stylish and as a result you will enjoy it even more. Classes are done a a comfortable dance studio. Great classes!! Damarys you are a delight to watch and to learn from. Thanks for all the tips and feedback. Wishing you were teaching this more often. Women need you. Super workshop! My first time in one of your classes and I cannot believe that I learnt in 2hours with you, more than in the last 6 month I've been taking regular classes. Your knowledge, passion and patient are refreshing and inspirational. I'll be back for your next styling course. Styling its the way in which something ( Dance) is performed. Our Styling classes , specifically Ladies styling technique consists in developing dance technique to increase self-expression, musicality, feeling, elegance, finesse and genuine dance style.​ We also offer man styling classes and workshops. Lots of tips , corrections and genuine dance styles. 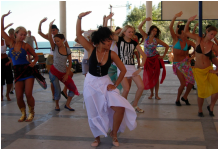 During the class we will have a variety of music , depending the style of Dance we are working on.